Moderate it: gazpacho is a delicious way to eat your veggies, and it’s quick to make too (no cooking, just some chopping). Make it crunchy, or puree and sip from cups – either way (or a combo of both, that’s how I make it), it’s a delicious way to use up the abundance of tomatoes and cukes that are about to hit us at a garden, farmstand, or CSA veggie share near you. Can’t wait! Stephanie’s note: I made this gazpacho without the egg or breadcrumbs, pureed half of it (I like a smooth-chunky texture), and used a variety of fresh herbs because that’s what I had on hand. However, I love the idea of the egg and breadcrumbs and would certainly include them (I was rushed). Like all gazpacho, this definitely improves with a bit of a sit – make at least a couple of hours ahead, a day ahead would be ideal. Place garlic and hard-cooked egg in a small bowl and sprinkle with salt. Mash together with a fork. Stir into liquid. Add bread crumbs and stir so that they dissolve into the liquid. Taste for seasoning and add salt, pepper, vinegar, and/or Tabasco to taste. Chill for at least 4 hours and serve. Garnish with chopped olives and diced avocado if desired. ∑ The recipe serves eight, but like homemade tomato sauce, its flavor improves with age – you can store it in the refrigerator and eat it for about a week. ∑ Why mash the garlic with egg and salt? To make a garlic-infused paste that adds body and substance to the tomato broth. 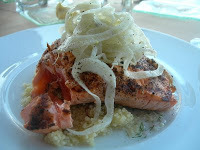 ∑ Use kosher salt to bring out the flavors of the vegetables. ∑ Try to chop the vegetables so that they’re small but not minced or pulverized, and don’t worry if the sizes aren’t uniform. The pieces should be small enough to chew but big enough to recognize. ∑ If you prefer a more elegant presentation, emulsify the chilled mixture before serving. Seasoning is a very personal matter. I tend to like my gazpacho pungent and sharp, with salt, lemon, and onion flavors lingering on the palate. If you want a spicier soup, add 2 tsp. of minced jalapeno peppers. To make vegetarian gazpacho, substitute vegetable broth for beef broth. In a large skillet over medium heat, sauté pancetta until starting to brown. Add sage leaves and continue sautéing, stirring frequently, until both pancetta and sage leaves are brown and crips. Using a slotted spoon, remove to a plate and set aside. If there isn’t much fat from the pancetta remaining, add 1-2 Tbsp. olive oil to the pan. Return to medium heat and add garlic and red pepper flakes (and capers, if using). 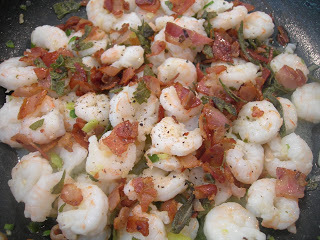 Saute for 1-2 minutes (do not brown), then add shrimp. Stir and sauté for a minute or two, then add lemon juice. Cook for a few more minutes, until shrimp are no longer pink and are cooked through. Remove from heat. Season to taste with salt and black pepper. Stir in scallions, top with reserved pancetta and sage, serve immediately.